If you’re looking for a new healthy Instant Pot recipe, a vegan curry to add to your dinner rotations, or an easy Indian dish, whip up this 20-minute Indian green bean curry with potatoes! It’s filling, healthy, gluten-free, and the perfect vegetable dish. I’ve had several requests throughout the months for easier traditional Indian dishes. 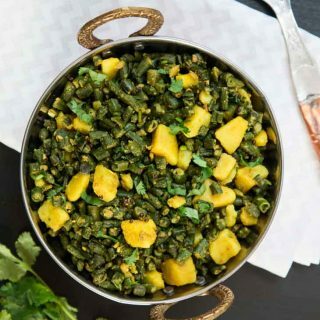 And although I love cooking and developing recipes from a wide variety of cuisines, Indian dishes (specifically traditional Gujarati meals) remain second nature for me since I grew up with those flavors. 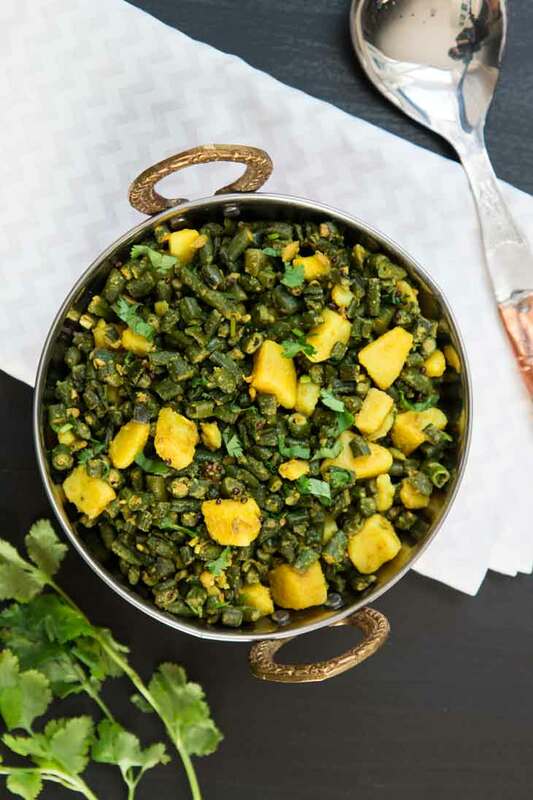 We enjoy different types of Indian food about 2-3 times a week, and this Easy Yard-Long Green Bean & Potato Curry recipe (also known as Fansi Bateta Shaak) is a family favorite! Let’s talk about green beans for a second. There are many different varieties of green beans. Most of you are probably familiar with the string beans of snap beans variety that is about 4-7 inches long, rounded, and green. But have you ever cooked or picked up some long beans? 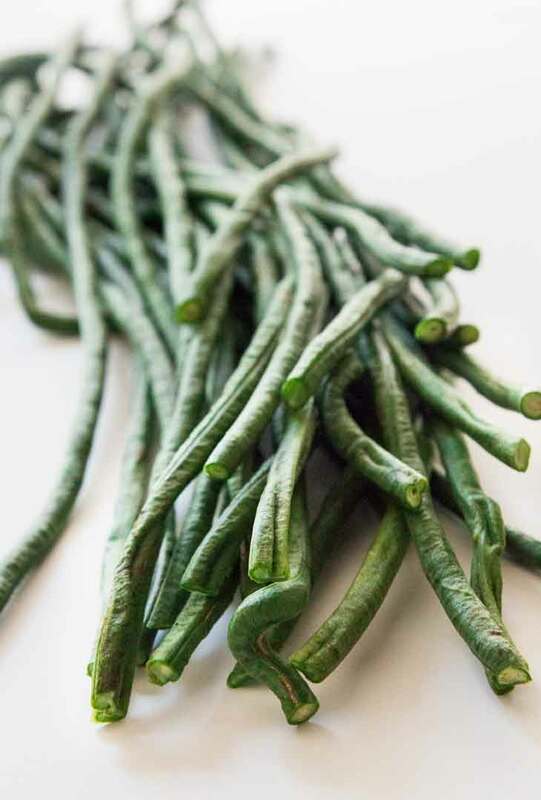 Long beans are also known as Chinese long beans, asparagus bean, or yard-long beans due to their length. They are about 12-18 inches long, slender, and contain immature pods in the bean. You can typically find them at local Asian markets. Despite these differences, long beans are similar in flavor, look like green beans (aside from their length), and can be cooked and used in the same way. For this green bean curry recipe, I specifically love using the yard long beans if I can make my way to my local Asian market, but if not, you can easily sub any other green bean variety. 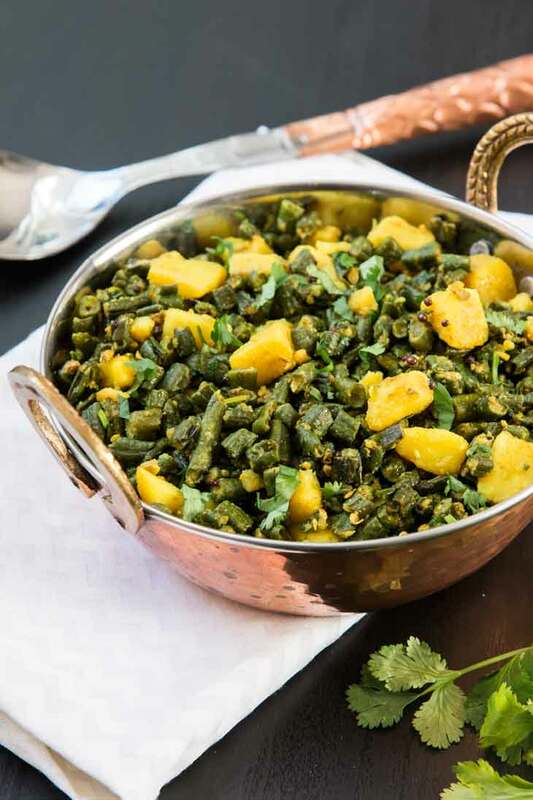 This easy green bean curry recipe is a traditional Gujarati Indian dish featuring 2 main ingredients, green beans, and potatoes, mixed in with a few dry spices. Heat some oil, throw in the green beans, potatoes, and spices, and make a 20-minute Instant Pot green beans recipe (stove-top directions included as well)! So if you’re looking for a new healthy instant pot recipe, an easy vegan Indian curry to add to your dinner rotations, or an excuse to try yard long beans for the first time, whip up this dry Indian green bean curry with potatoes! It’s filling, healthy, gluten-free, and the perfect vegetable dish. Enjoy it with some cooked rice, pulao, naan, or fresh roti, and serve it with a side of lentil soup for a complete meal! This easy 20-minute Indian green bean curry with potatoes is healthy, gluten-free, and the perfect vegetable dish. Trim and discard both ends of the green beans. Working with as many green beans as you can at once, chop them into small pieces (1/4-in long or smaller). Peel and dice the potatoes into ~3/4-in cubes (you can leave the skin on if you prefer). Add and heat the cooking oil, then add the mustard seeds, asafoetida, and minced garlic (if using). Fry for a few seconds. Add the chopped green beans, diced potatoes, ground turmeric, red chili powder (if using), and 1/4 teasp salt (add more later). Mix well. For Instant Pot Method: Add all the water, mix well, and close the Instant Pot lid. Select the Pressure Cook button to cook on high pressure. Set the timer for 2 minutes. When the time is up, allow the pressure to release naturally for only 5 minutes, and then manually release the rest of the pressure. Open the lid and set to Saute mode again (normal). For Stove-top Method: Add half the water, cover the pan with a lid, and cook on medium-low heat until the potatoes and green beans are cooked and tender (about 10-15 minutes, potatoes should remain intact). Stir occasionally. During this time, if the water dries out, be sure to add 1 tbsp at a time as needed to cook and keep the green beans and potatoes from sticking to the pan. Once the green beans and potatoes are cooked and tender, add the ground cumin and ground coriander. Mix well and cook uncovered on medium heat for an additional 2-3 minutes. Stir occasionally and burn off most of the excess liquid remaining. Add salt to taste and a small amount of freshly squeezed lemon juice. Mix and garnish with finely chopped fresh cilantro. Serve hot with rice, Naan, or roti. Long Green Beans - For this Gujarati recipe, I specifically love using the yard long beans if I can make my way to my local Asian market. But you can easily sub for any other green bean variety. Spices - Asian stores sometimes have both ground cumin and ground coriander combined into one spice packet. If this is the case, add the sum of the combined amount. Omit if you do not have this spice. Although this powder is naturally gluten-free, it is almost always manufactured by diluting it significantly with wheat flour. There are some brands you can find that make it with rice flour. If you are uncertain and have a strict gluten-free diet, then omit this ingredient. Kid-Friendly Version - Omit the cayenne or red chili powder if needed. I imagined you guys must! I'd love to try your moms version! I love trying out new foods, like long greens. I've never had them before, but looking forward to trying this recipe! Curry is one of mine and my family's favourite meals, so I'll be sure to bookmark this delicious version of yours! Thank you for sharing the recipe. thank you!! hope you get a chance to try it! I'm not sure I've ever had long beans, but this looks so yummy! Yum! I can't wait to try this. I love green beans so much! Curry is the BEST! And we so need to get an Instant Pot. But thanks for both instructions, so we don't have to wait to give this one a go! Can't wait to try it! A suggestion: This recipe would be so much easier to print and follow, if it had 2 separate sections for Instant pot and Stove top cooking. Awesome! Great to know...I was guessing the best way to separate it and not make it a huge recipe. I'll change it! I may be missing something but I only noticed 1/4 cup of water. That doesn't sound like enough for the Instant Pot. I have only had my pot 3 weeks but I have read you need at least 1 cup of water to come to pressure. Hi! You should only need about 1/4 cup water for this recipe otherwise it'll be too liquidy when done. It's enough to come to pressure, plus water is released from the green beans when they get cooked inside as well. You don't need it to stay at pressure for very long. Let me know if you try it!